Left: Lavender Hill honey beer, Right: Battersea Rye. It’s funny to think of Sambrook’s as an old timer in the ‘new’ London brewing scene, but that’s pretty much what it’s become. Now at the ripe old age of five, it’s spent most of that time quietly claiming the handpulls and hearts of south London, with beers like Wandle and Junction. These stalwart beers (not unlikeable, but perhaps hard to think of as special) have been joined by the likes of Pumphouse Pale Ale and Powerhouse Porter, both acclaimed examples of their respective styles. On Saturday I was kindly invited by Jo at Sambrook’s to their fifth birthday celebration. 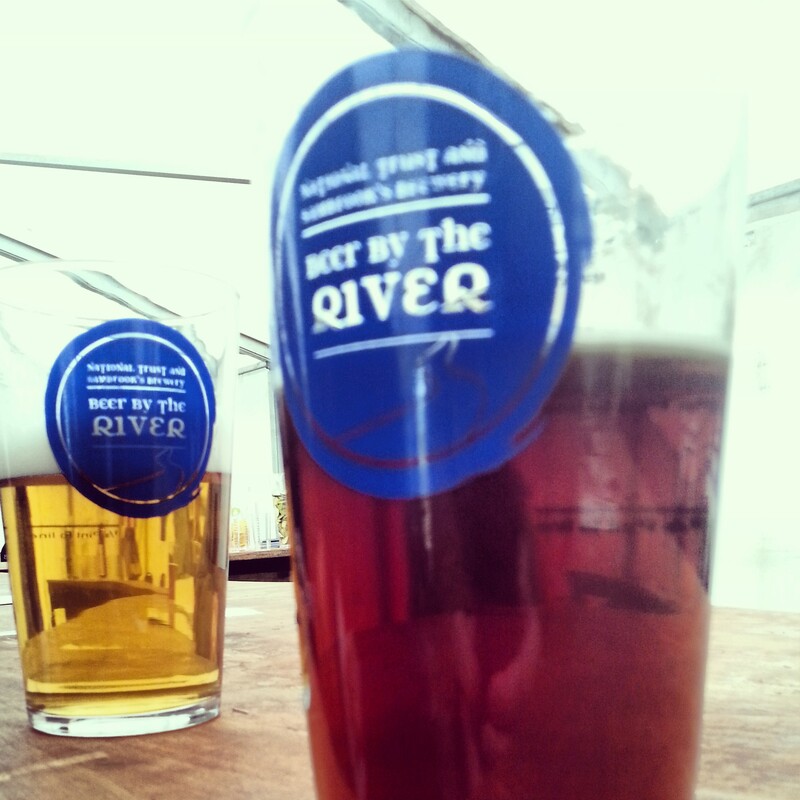 ‘Beer By The River’ was a joint venture with the National Trust, held at Morden Hall Park by the river Wandle. A fitting location, yet sadly hampered by damp and drizzly weather that had people hiding in the beer tents for most of the afternoon. 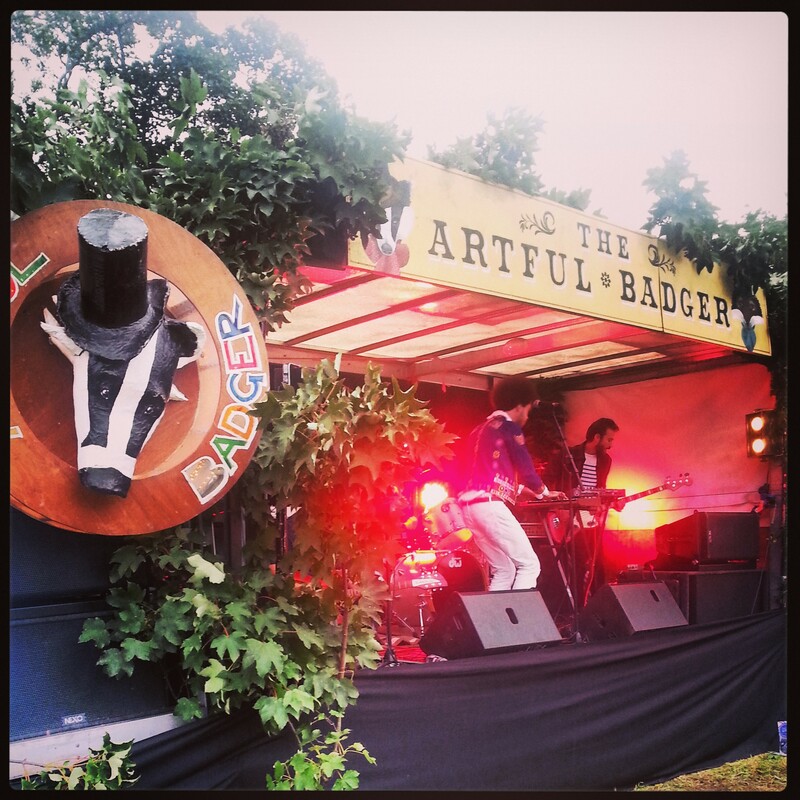 The setting was a walled-off part of the park, with a stage provided by the Artful Badger, showing excellently named folk and indie acts such as Toyface and The Hallouminati. Two beer tents were separated by a line of food vendors: Ginger Pig, Dessert Deli and Fish Club. There was also face painting and a few ducks, chicks, rabbits from Deen City Farm (for the benefit of families attending the afternoon session – no adults were quaffing ale with their face painted like a tiger, sadly). 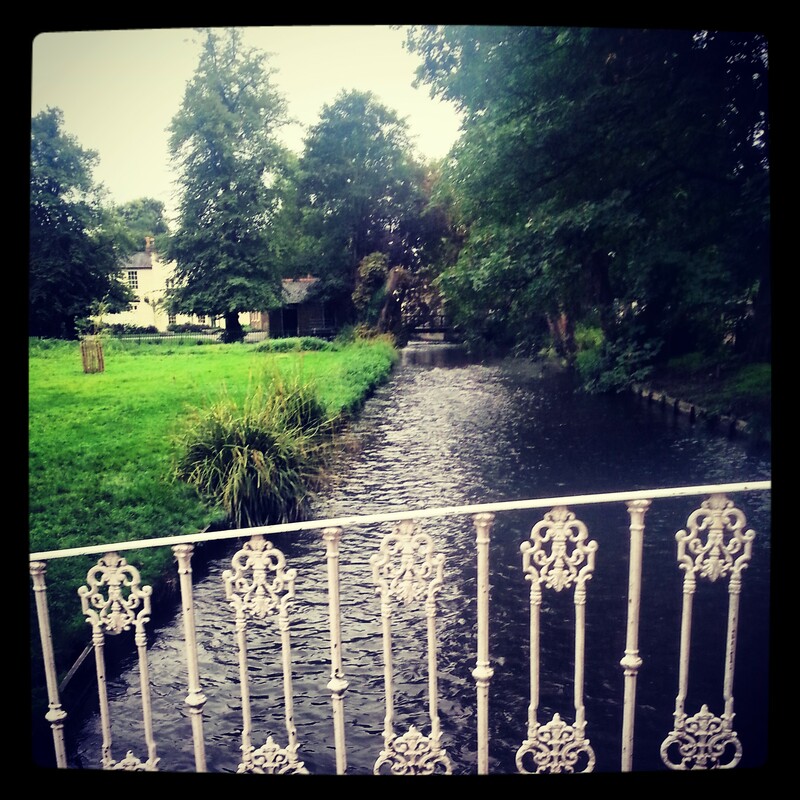 The only thing missing was a view of the Wandle itself, which was disappointingly obscured by a brick wall. Folie Ordinaire performing on the Artful Badger stage. Naturally, my main focus was the beer on offer, which you got two 1/2 pint tokens for on arrival. I was pleased to see a couple of Sambrook’s beers I hadn’t tried before: Lavender Hill braggart (honey beer) and Battersea Rye, a seasonal special for autumn. The Rye in particular was lovely: the pepperiness balanced with earthy British hop bitterness and a very indulgent palate of crystal and chocolate malt. It was by no means a Sambrook’s-only festival though. Gadd’s, Five Points, London Brewing Co and Tap East all had cask beers served on gravity behind the bar. My favourites of the day were the three beers from Tap East: Niwot India Red Ale, Smokestack Porter and their outstanding American Pale Ale. Their beers absolutely shone all day long, unlike that pesky sun slacking off behind the clouds. For a ‘small’ range of beers, it was incredibly varied in terms of styles, strengths and flavours. The food selection was quite varied too, with plenty on offer for meat eaters, but perhaps a bit limited for vegetarians. Having said that, the beer battered halloumi from Fishclub was apparently very good indeed. I plumped for a very enjoyable box of fish and chips (line caught haddock and twice cooked chips, dontcha know, though one nearby Chip Wanker remarked he could taste that they had ‘only been cooked once’). That cost £9.50, though in real terms it was only £4.50 since the entry ticket also gets you a £5 food voucher. The fish and chips went down very nicely with a glass of Five Points Pale Ale, which, whilst seeming a little flat served by gravity, still had an incredible tropical fruit aroma. 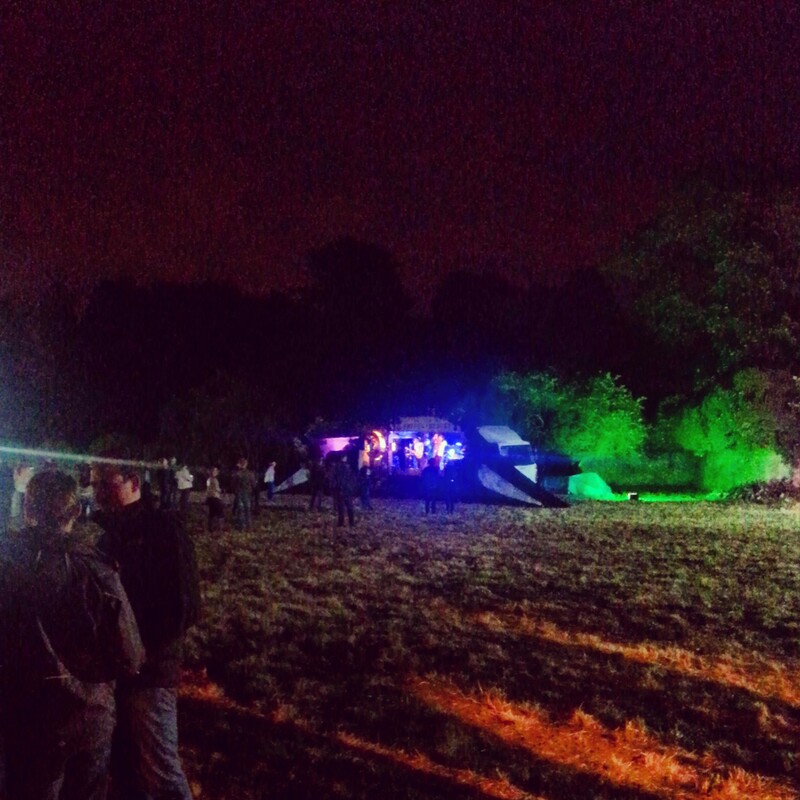 For most of the afternoon, the event was quiet, with sixty or so people plodding about the muddy field. It was a shame, because if the weather had been as willing as the Northern Line (spectacularly free of engineering works for once) it could have had a great atmosphere all day. Originally, the event was set to run as two sessions – 12pm-5pm and 6pm-11pm – but due to the decreased turnout, they instead ran them together. It was a shrewd decision, and the place really came alive just after 6, when the long-haulers decided to stay for ‘just one more’ as a fresh crowd arrived. It was around this time that I decided to cash in my voucher for a 1/3 pint of Sambrook’s 5th birthday celebration beer: their new No 5 Barley Wine. This 8.2% warmer was an impressively (and dangerously) drinkable beer, with banana, malt loaf and sherry notes ending in a curiously dry and moreish finish. Keep your eyes peeled for a bottled version.